Cannondale consistently offers up great deals on some of its range, but the extra cost of HammerSchmidt on all the bikes here means something has to give elsewhere, and the decent (if not spectacular) build ends up tipping the scales at a hefty 34.7lb. Last year’s slightly lighter carbon Moto was too steep and high for us — this year Cannondale has adjusted the shock links to reduce the BB height by a claimed 1cm and the head angle by 1deg. These ‘push’ links are also available to convert older Motos to the new geometry. For 2010, the aluminium frame comes with Maxle Lite, a full 1.5in head tube and ISCG 05 tabs in a galvanised finish with red and black anodised ‘hatchet’ linkages and covers — detail and finish isn’t as smart as the Scott or the Lapierre, but they are both around £1,500 more money. The pivot position stays at the same neutral tried-and-tested position. We only measured a slight drop of 5mm in the BB height and around a 0.4deg slacker 66.6deg head angle from the revised links — but this is still welcome, surprisingly noticeable and more suited to the bike’s purpose. Wheels are Mach1-branded rims with Formula hubs, which are slightly hefty, stopped by new Magura Louise Bat brakes. After rating these last year, Magura’s habit of constantly changing parts caused us some headaches this time out. Fair enough that UK conditions killed the Louises (all brakes on test suffered), but servicing them was a pain and we couldn’t get the latest pads anywhere we needed them when out riding. Controls-wise there is a nice short stem and some decent own-branded kit alongside SRAM X9 shifting, but the FSA XC riser bars were too narrow for hard riding — where’s last year’s 720mm-wide bar? Front and rear suspension is 160mm of air-sprung travel. RockShox supplies both fork and shock — namely the Lyrik IS 2-step adjustable 160mm/115mm fork, and a Monarch 4.2 Solo Air rear shock. Both these units complement each other well on this bike. The Monarch 4.2 offers rebound adjustment, as well as the two-position floodgate lever — where you can set the threshold to overcome/interact with the damping circuit. The Lyrik fork offers internal Motion Control IS (IS means additional integrated high-speed compression speedstack), external rebound and low-speed compression dial, and a lighter Maxle for 2010. 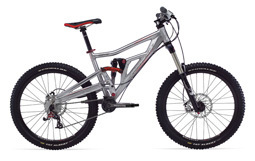 Back-to-back swaps while climbing revealed that despite being comfortably the heaviest bike on test, the Moto climbs or pedals along with a real sense of purpose that defies its bulk. This makes it just as capable of getting to and from all those technical descents and playful sections as any of the lighter bikes. The suspension is balanced, supple and active throughout the stroke. Rider position is spot on front to rear, but the Moto still feels a little high at the BB — meaning your centre of gravity is higher. The Cannondale is quite dynamic side-to-side on the trail, and combined with the shortest on-test wheelbase, also easy to chuck about. This makes for an easy and fun bike, even with this lack of length — there are no nasty surprises from the controlled suspension and rider positioning remains neutral through the travel. Despite the 1.5in head tube, steering precision with the Lyrik somehow doesn’t feel as immediately razor-sharp as the oversized head tube on the carbon version we tested last year. Presumably fairly consistent interaction with the Moto pivot placement means the 24t ring of the HammerSchmidt hasn’t added any inherent pedalling or suspension issues. The nature of the Cannondale, in fact, suits the play-orientated outlook of HammerSchmidt — never having any chain issues, the extra clearance and the built-in bash guard encourage getting off the beaten track. The Cannondale Moto 3 is a fun bike to ride. There is stacks of grip on offer and the riding position is neutral and balanced, despite still being too high at the BB. The Moto is also a really positive pedalling machine, if a little heavy to be a true all-mountain contender, and a tad short for full-on Alpine descending. For us, simply getting out and riding fun stuff away from the groomed trails springs to mind thinking about the Moto’s capabilities, and this matches well with the whole ethos of HammerSchmidt in our eyes. Considering it is a lot less expensive than some bikes here, performance is pretty good, and overall it’s a better bike than last year. We enjoyed bashing around the steep, wet hillsides on it in the mud — it never felt unsure or unconfident, and it is a bike that just gets on with it.